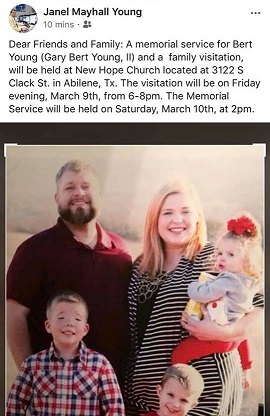 There will also be a service in Abilene, TX on Saturday, March 10th; exact details TBD. Gary Bert Young II passed away on the morning of February 22, 2018 at Memorial Hermann Hospital in Houston, Texas at the age of 37. The funeral service will be held Saturday, March 3rd at 2PM at Ecclesia Clear Lake. Jeff Raymer and Lonnie L. Mayhall will be officiating. Visitation will be Friday, March 2nd from 6-8PM at Ecclesia Clear Lake. The church is located at 218 Clear Creek Ave in League City, Texas. Bert was born on November 12, 1980 in Bryan Texas to Gary B. Young and Janel Mayhall Young. Bert attended school at Jim Ned from 2nd -12th grades. While in school Bert served as a firefighter with the ECCA Volunteer Fire Department and at 18 he became an ECA (medic) so that he could provide medical attention in emergency situations to those in his rural west Texas community. While in high school Bert won state awards in science fair and in FFA which led him to receive a Houston Livestock Show scholarship that he used at Texas A&M. As a proud 2nd generation Aggie, he earned his degree in mechanical engineering in 2004. 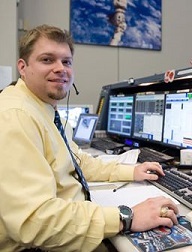 The summer following his graduation, he married Amber Marie Marsalis, and moved to Houston to begin working at NASA. While there, he was a certified Space Station flight controller and astronaut instructor for the Operations Support Officer (OSO) team from 2004- 2014. Bert became a part of a unique cadre of the NASA team who were both flight controllers and instructors, the best of the best, who were known as “Top Guns.” After leaving NASA, he began working as a Reliability Engineer for Solvay/Eco Services, a sulfuric acid production and regeneration plant. During his 3 years at Solvay/Eco Services, he oversaw improving the overall reliability of several production areas and implemented a system for minimizing process duct leaks that was adopted across the entire company. Bert was always a loving and dedicated husband, as well as, a very hands-on, doting dad who loved spending time with Caleb, Jaxson, and Bella. He was an avid outdoorsman who enjoyed hunting, fishing, and sports. He always had a natural talent for fixing things; whether it be working on one of his vehicles, helping a neighbor, fixing things around the house, or drilling water wells in El Salvador for Living Water International. There wasn’t much he couldn’t fix. Bert also had a deep love of music that started at the early age of 4 when he began Suzuki violin. Later he played the piano, coronet, lead and base guitars, and the drums. He enjoyed playing praise music in his youth group, churches he attended in League City, and for services at Church Under the Bridge’s Houston homeless ministry. Bert is survived by his high school sweetheart and wife of 13 years, Amber Marsalis Young; their 3 children Caleb, Jaxson, and Bella; his parents, Gary and Janel Mayhall Young; his sister and brother-in-law, Dr. Traci King and James King III; uncles and aunts, Lonnie and Sandy Mayhall, Lowell and Johnna Young, Sharon Brazell; cousins, Chad, Curt, Norman, Christopher, Jessica, Shantel, Tori, Malorie, Kayden, Abigail; and numerous other cousins; nieces and nephews.